Pottermaniacs will enter the ‘Wizarding World’ through a station archway named after Hogsmeade, the magical village near Hogwarts. A plume of steam and a train whistle will sound the arrival of the Hogwarts Express. Other rides include the ‘Dragon Challenge,’ a twin high-speed roller coaster themed after the ‘Triwizard Tournament’. There will also be a family roller coaster called ‘Flight of the Hippogriff,’ named after a creature with an eagle’s head and a horse’s body. Every shop and restaurant is Potter-themed. Honeydukes sells chocolate frogs and ‘Bertie Bott’s Every-Flavour Beans,’ Ollivander’s peddles magic wands, Zonko’s joke shop has Sneakoscopes, and the British restaurant Three Broomsticks pours Butterbeer. At The Owl Post, guests can send letters with a certified Hogsmeade postmark. Magical instruments and equipment are available at Dervish and Banges, including everything needed to play Quidditch – a game like soccer played on flying broomsticks. I’m really excited about this project. 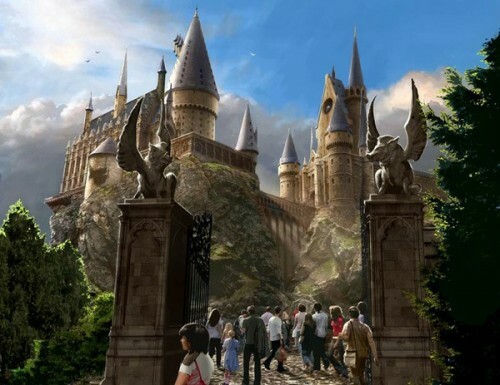 From the pictures, it looks like they are basing Hogwarts and the Hogsmeade shops on how they look in the movies. I’m pleased with that because I feel like the movies are a perfect recreation of the books. One thing I didn’t see mentioned in the Daily Mail or the New York Times articles is Diagon Alley. Universal’s website actually says that Ollivander’s wand shop is located in Hogsmeade, so I’m guessing Diagon Alley isn’t part of the attraction. That’s a bummer but I guess they can’t include everything. Check out Universal’s website for more information. You can also check out Daemon’s Movies for more concept pictures and a video.